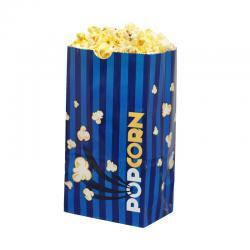 Main Category: Commercial Fun Food Equipment & Supplies | Type: Bag | Hayes Specialties Corp. This 12&rdquo x 18&rdquo unprinted bag is the same as the GM3064 just in a smaller 100 count quantity. It is perfect for small events or rentals. 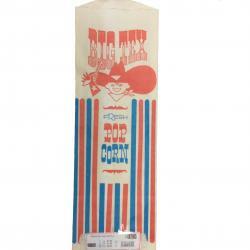 The Big Tex Popcorn Bag is 18.5 inches long and 5.75 inches wide. With red, white, and blue coloring this bag is sure to catch the eye of potential customers. This white bag is great for pretzels, cookies, or other similar items. Each bag measures 5.5 inches by 4 inches. 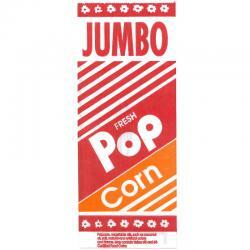 The bright red and orange design quickly grabs attention and helps to sell more popcorn These No. 2 popcorn bags each hold .6 oz. of popcorn and are packed 1,000 bags per case. 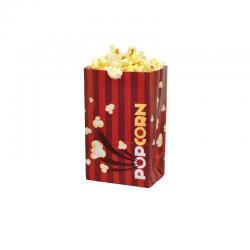 The bright red and orange design quickly grabs attention and helps to sell more popcorn These No. 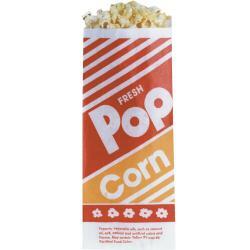 3 popcorn bags each hold 1 oz. of popcorn and are packed 1,000 bags per case. 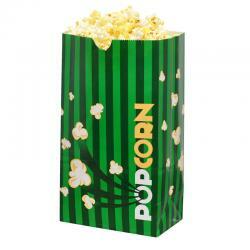 The bright red and orange design quickly grabs attention and helps to sell more popcorn These No. 4 popcorn bags each hold 1.1 oz. of popcorn and are packed 1,000 bags per case. 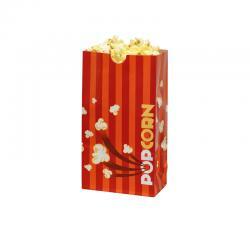 The bright red and orange design quickly grabs attention and helps to sell more popcorn These 12" jumbo popcorn bags each hold 2 oz. of popcorn and are packed 2,000 bags per case. 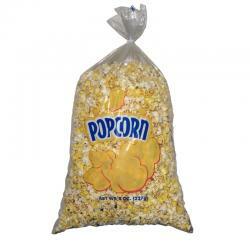 30 inch Heap o' popcorn bag. 30 inches. Holds 6.5 ounces of popcorn. 1000 per container. Perfect for taking home. 18 inch. Holds 3 ounces of popcorn. 1000 per pack. 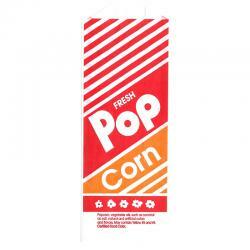 They are the perfect poly bags for your entire popcorn line. Sealable with our Kwik-Lok ties. These 46-oz. 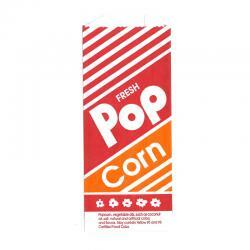 laminated "butter" bags are leakproof and quickly grab attention with the bright white kernels popping off the orange background. Holds 1.5 oz. of popcorn. Sold 1,000 per case. These 85-oz. laminated "butter" bags are leakproof and quickly grab attention with the bright white kernels popping off the blue background. Holds 2.5 oz. of popcorn. Sold 1,000 per case. These 130-oz. laminated "butter" bags are leakproof and quickly grab attention with the bright white kernels popping off the green background. Holds 4 oz. of popcorn. Sold 500 per case. These 32-oz. laminated "butter" bags are leakproof and quickly grab attention with the bright white kernels popping off the red background. Holds 1 oz. of popcorn. Sold 1,000 per case. For long lasting flavor and freshness, pack your caramel corn or corn treat popcorn in bags made to extend it's shelf life. Now made in the USA with improved materials. Use with our Heat Sealer Deluxe-UI #17060 8 inch or #8964 12 inch. 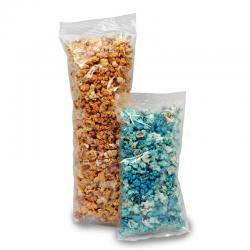 Bag is pictured on right with blue popcorn. For long lasting flavor and freshness, pack your caramel corn or corn treat popcorn in bags made to extend it's shelf life. Now made in the USA with improved materials. Use with our Heat Sealer Deluxe-UI #17060 8 inch or #8964 12 inch. 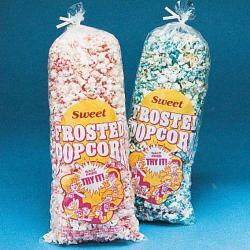 Bag is pictured on left with caramel popcorn. 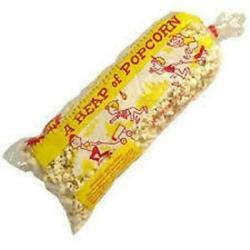 Heap O' Popcorn bag. Measures 12" x 25". Holds 14 ounces of popcorn. 500 per container. These plastic bags measure 16 inches by 6 inches. 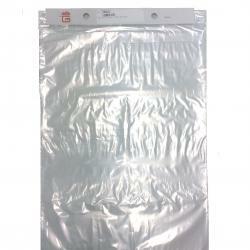 These plastic bags measure 16 inches by 6 inches and when filled, make an eyecatching display for customers. These plastic bags measure approximately 18 inches by 6 inches and when filled, make an eyecatching display for customers. 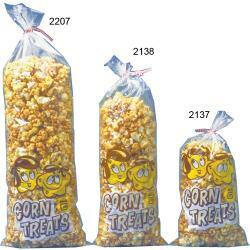 Give customers a Heap O Corn, with these 32 ounce Heap O Corn Bags. They measure approximately 3'2" x 1'. Heap O' Popcorn bag. Holds 8 ounces of popcorn. 500 per package.